“Whether you make dhyana of God or of Self, it is immaterial. The goal is the same. But you cannot escape the Self. You want to see God in all, but not in yourself? 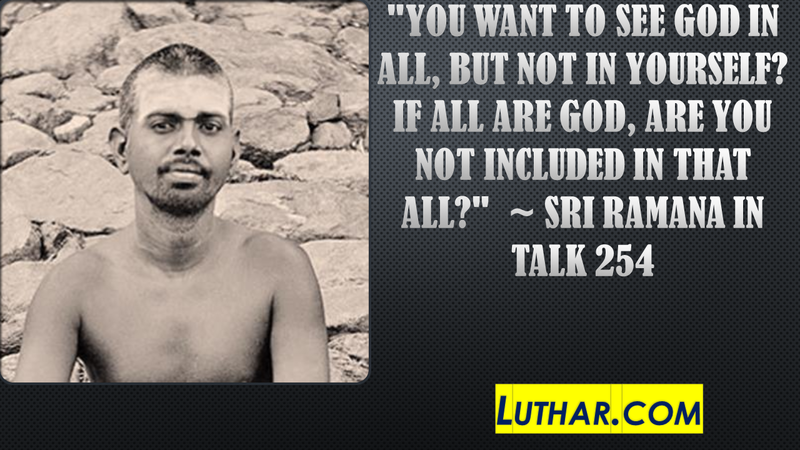 If all are God, are you not included in that all?” Sri Ramana speaking in Talk 254 (Talks with Sri Ramana Maharshi). Devotee: Is the Universal Soul (Paramatma) always different from us? Sri Ramana: That is the common belief, but it is wrong. Think of Him as not different from you, and then you achieve identity of Self with God. (Talk 31). Losing a loved one is a natural cause of grief for us. We have to eventually reconcile with the fact of death of those we loved, and cherish the joy that arises in the heart when we think of them. Sages teach us that the death of the body is inevitable. We are not the body but the Spirit. That is the message of Bhagavad-Gita as well.